The Internet of Things (IoT) market is huge, and has the potential to become even larger. Market reports and white papers from research firms, industry leaders, and government agencies worldwide have predicted different, but equally impressive annual revenues for IoT-enabled tech in the trillions of dollars. And with so many variations given to IoT—from analytics to industry—it’s one of the most “fertile grounds” for startup companies, especially those in the optics and photonics sector. Optics and photonics products—including sensors, optical fibers, LEDs, imaging systems, and lasers—are integral to IoT applications. Yaffe was one of five photonics company executives chosen to give a three-minute “pitch” to top equity investors at the OSA-partnered Plug & Play IoT EXPO in Sunnyvale, Calif., USA, in December 2015. Yaffe’s pitch was for New Ridge’s IoT-enabled NRT-8000 optical spectrum analyzer (OSA). The market for New Ridge’s OSA includes fiber optic companies (e.g., telecoms, cable networks, undersea networks), as well as universities and developing countries where equipment price-points are very important. The first adopters have been manufacturers of fiber-optic transmission equipment who are currently using NRT’s compact OSA to lower manufacturing costs. Yaffe says that his IoT-enabled NRT-8000 is targeting the US$100 to US$200 million per year OSA market. Yaffe says the instrument has gone from prototype to general release since the Plug & Play event. The company also upgraded the OSA including new features like an IoT T&M portal, multi-trace scanning and data-logging. The initial roll-out of the NRT-8000 OSA received a lot of attention from New Ridge’s competition. “It’s a compliment,” says Yaffe. “Recently two competitors have announced their own compact OSAs, but not as much on the IoT side.” One of Yaffe’s competitors said New Ridge in effect defined the compact OSA as a completely “new OSA market segment”. written by Sarah Michaud (michaudedits@gmail.com), a freelance science writer based in Vienna, Austria. 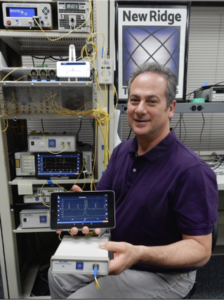 This entry was posted in About Us, OSA and tagged Henry Yaffe, Internet of Things, IoT, New Ridge Technologies, NRT-8000, optical spectrum analyzer, Test and Measurement. Bookmark the permalink.